Andrew Moses — Laguna Beach Live! Seventeen year old Andrew Moses is a composer and clarinetist from Los Angeles, California. Hailed at age 13 as "an artist to watch" and "a musician of enormous talent", his compositions have been performed, premiered, and read by ensembles such as the Los Angeles Philharmonic, the Calder Quartet, and the Argus Quartet. Andrew has been a Composer Fellow with the LA Phil since 2013, and continues in 2015-2016 as an LA Phil Senior Fellow. His chamber works have been performed in concert as part of the 2015 Hear Now Festival of New Music in Los Angeles, by wild UP at the Regent Theater as part of the LA Phil’s "Next on Grand" Festival, by ICE at the Ojai Music Festival, as part of theYellow Barn Young Artists Program in Vermont, and in readings by the Los Angeles Master Chorale and Los Angeles Philharmonic Chamber Ensembles. Upcoming projects include acommission by the LA Phil for their groundbreaking Green Umbrella new music series. The LA Phil premiered two short symphonic works of his at Walt Disney Concert Hall in the past two seasons. He was a finalist in the 2014 ASCAP Morton Gould Composer Awards. As part of the LA Phil Composer Fellowship Program, he has participated in masterclasses with composers such as Kaija Saariaho, John Corigliano, Magnus Lindberg, and Esa-Pekka Salonen; and his primary teachers have included Andrew Norman, James Matheson, A.J. McCaffrey, and Sarah Gibson. 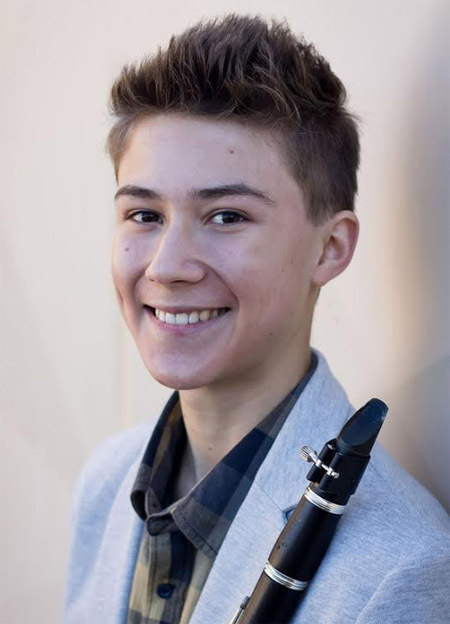 As a clarinet student of Dr. Margaret Thornhill, he was a winner of the 2014 Young Musicians Foundation National Debut Concerto Competition, the Torrance Symphony Orchestra Concerto Competition, the Beverly Hills Auditions, and the Midland National Young Artist Competition. Andrew made his solo New York City recital debut last year at the home of Charles and Susan Avery Fischer as part of iPalpiti Musicales. He has been featured twice on From the Top on NPR and is a recipient of From the Top's Jack Kent Cooke Young Artist Award. On the Southern California Recital Circuit he has performed over 25 solo recitals in the last two seasons. Andrew has thrice participated in the Yellow Barn Young Artists Festival in Vermont; and he is a Junior of iPalpiti Artists International. As past clarinetist with the Colburn School Honors Woodwind Quintet he has been heard three times as part of Sunday’s Live from the Los Angeles County Museum of Art (LACMA). Andrew has appeared as a concerto soloist with several area orchestras, having performed as concerto soloist in the Walt Disney Concert Hall at the age of 11. Committed to serving the community through Arts Leadership Initiatives, the California Senate joined in recognizing his contributions to the local arts and presented Andrew with the “Making a Difference Award”. In his spare time, he enjoys taekwondo (he is a third degree blackbelt), philosophy, and his community of faith.